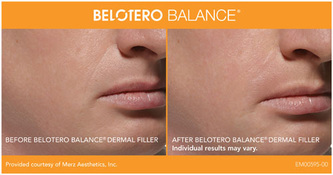 Not only are results with BELOTERO BALANCE® Dermal Filler instant, they are proven to last. In a clinical study, many patients saw results that lasted about six months or more. BELOTERO BALANCE® Dermal Filler is injected into the skin using a very fine needle, filling in your wrinkles right before your very eyes. 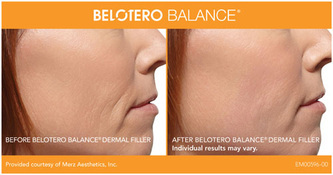 BELOTERO BALANCE® Dermal Filler works instantaneously to plump your skin, filling out your wrinkles and folds so you'll leave Riva Dermatology knowing BELOTERO BALANCE® Dermal Filler is working for you. 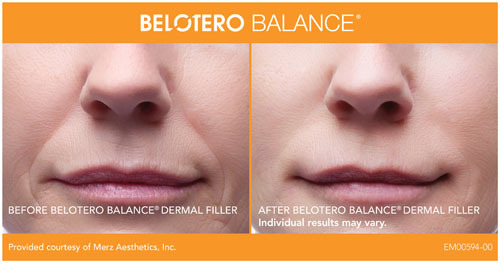 onClick="_gaq.push(['_trackEvent', 'Outbound Link', 'Click', 'Belotero']);"